Send Gifts To Romania is delighted to offer you exotic fruits that you can send to your loved ones in Romania! Star Fruit or carambola is native to the Phillipines, Indonesia and India. Star fruits are best consumed when ripe, when they are yellow with a light shade of green. This fruit is entirely edible, including the waxy skin. 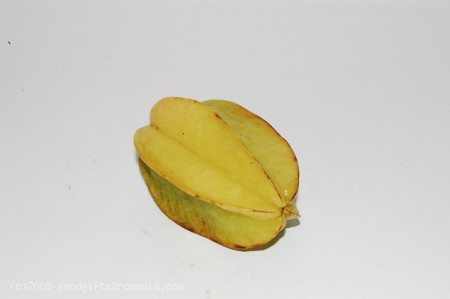 Its healt benefits are well known, Carambola containing antioxidants, vitamin C and low in sugar. Our online gift store offers you gift deliveries to Romania 100% quality guaranteed. Compose and send a gift basket to Romania now!